I couldn’t be more excited to share this first (of probably many) Christmas post with you. 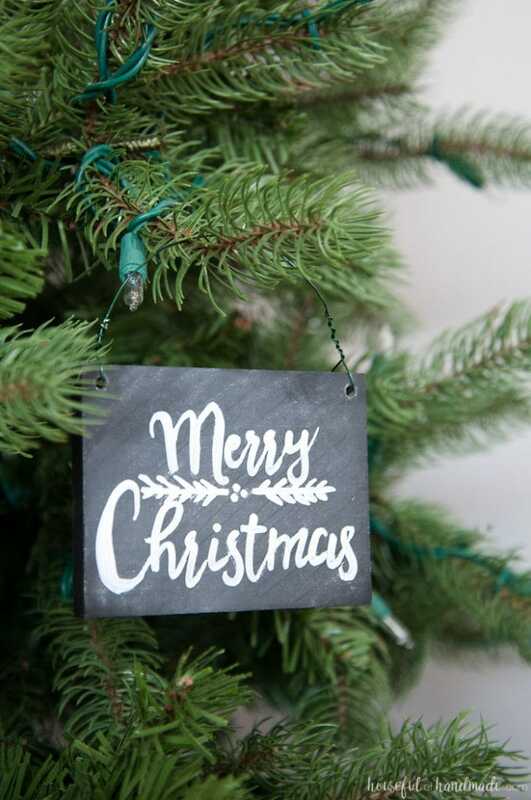 I had so much fun making these DIY Chalkboard Sign Ornaments and they are so pretty on the tree. Sadly, I made these for the 2016 Ornament Exchange & Blog Hop so I’m sending these ornaments off to a new home. 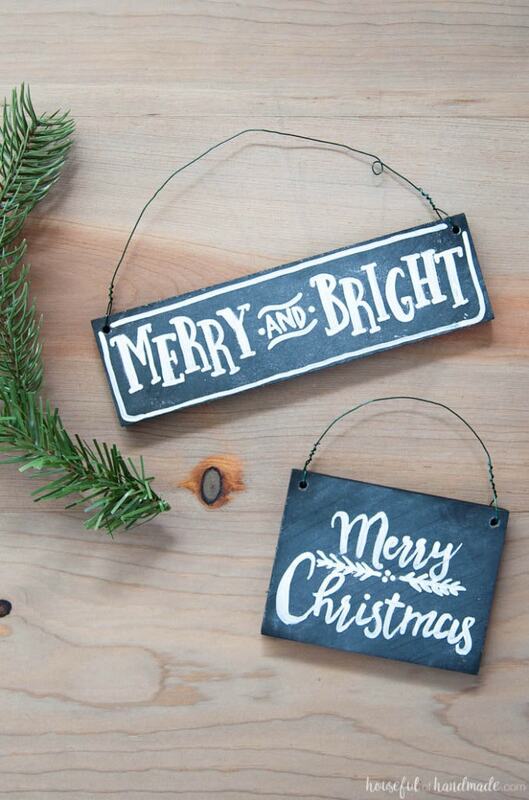 I really hope Sherry from Olives & Okra loves these DIY chalkboard sign ornaments as much as I do. You better believe I am planning on making some more for my tree too! Welcome to the 2016 Ornament Exchange & Blog Hop! This year, there are 11 pairs of partners or 22 talented ladies participating in the exchange. The rules of the challenge were simple – create a handmade ornament for under $15 to exchange with a partner and create a tutorial to share on the blog hop! When I found out that Sherry has a rustic Christmas tree too, I knew it was the perfect match. You know I love all things rustic and couldn’t wait to create something to exchange with her. But before we get into the tutorial, I want you to meet these other amazing ladies who are participating in the ornament exchange this year. Make sure to stop by and say hello, you are going to love all the handmade ornaments they put together too! Kati · Houseful of Handmade || Beverly · Across the Blvd. When it came time to make my ornaments for the exchange, I will admit I had a hard time. It has been so warm here (I am wearing shorts and a t-shirt while I write this) that I’m just not feeling much in the Christmas spirit. This morning on my Facebook memories, a picture of my kids decked out in their coats and snow gear knee deep in fresh snow came up. Yep, this day 4 years ago we were shoveling a foot of snow off our cars and today I am putting up the Christmas tree hoping maybe it’ll start looking a little like Christmas. After I got over my “It doesn’t feel like Christmas” problem, I realized that I could use the warm weather to my advantage. I wouldn’t have been able to go outside and spray paint these chalkboard plaques in the snow! And that’s exactly what I did, I slipped on my flip flops and grabbed a can of chalkboard spray paint and the end result was just perfect. So even if it doesn’t feel like Christmas where you are, maybe a few DIY Christmas ornaments will help you get in the spirit. It has definitely helped me out! 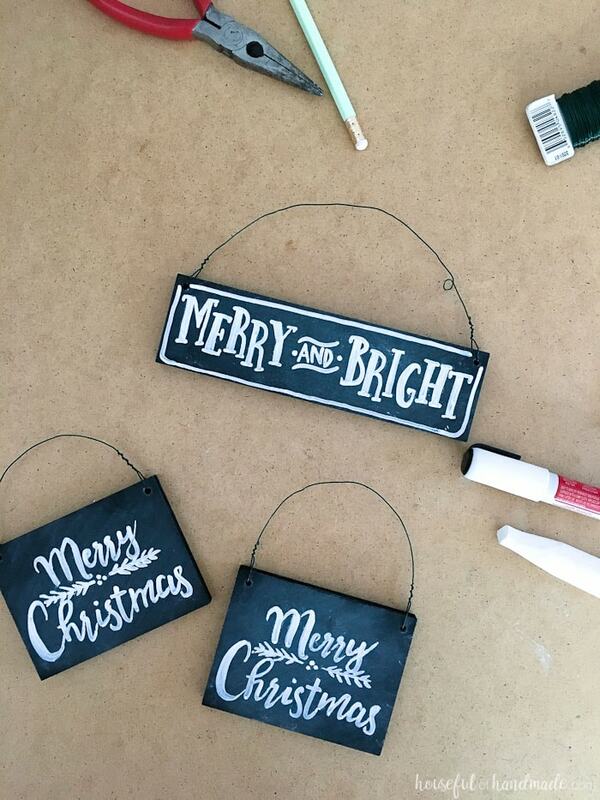 Click the link below to get the tutorial for these DIY Chalkboard Christmas ornaments (including the printable lettering template I used). Then make sure to check out some of the other fun homemade ornaments below! Those are so cute! I’m hoping those plaques ship to France! I gotta do this! Thank you for the inspiration and the resource! I hope they ship too! But really you could any kind of wood. Have fun crafting. Thanks Iris. I agree, there are so many great ornament ideas! They are absolutely adorable!! I love anything chalkboard – it adds a such rustic-y feel! These would be cute gift toppers also! Love the idea of using them as gift toppers! These are adorable! Chalkboard paint is so much fun! Love all things chalkboard! These are awesome! Loved hopping with all of you! These are just charming and would be so fun for a family Christmas tree. Thanks Sarah! You could even let the kids decorate their own if you wanted to. These look great! I love chalkboard ornaments and they would go well on top of packages too. They would be so cute on top of packages and gifts for the season. Thanks for the great idea! I seem to be obsessed with chalkboard decoration all the time 😉 Thank you Emily! I love using chalkboard ornaments. Yours are great! Thanks for providing the printables, too. Those are so cute! I love how they look on the tree! Love these chalkboard signs and seriously want to make one myself. This would be gorgeous on any tree!! Super cute ornaments, I have white signs on my tree. I love the chalkboard ones as well. Pinning for next year. The white signs and the chalkboard sign together would be so great Leanna! Thanks for pinning. Super cute ornaments!! I like that you used chalk on the back of the paper to make the lettering! Great idea I will totally try. Thanks Kim! I am not so good at hand lettering so this is my secret. These ornaments are wonderful. I love the rustic look. You got into the spirit as if it were snowing outside your window. They are so charming. Very cute! This could go with any decor. I am visiting from the Ornament Exchange. I love the chalkboard look. These would make such a pretty addition to any tree and as present toppers too. 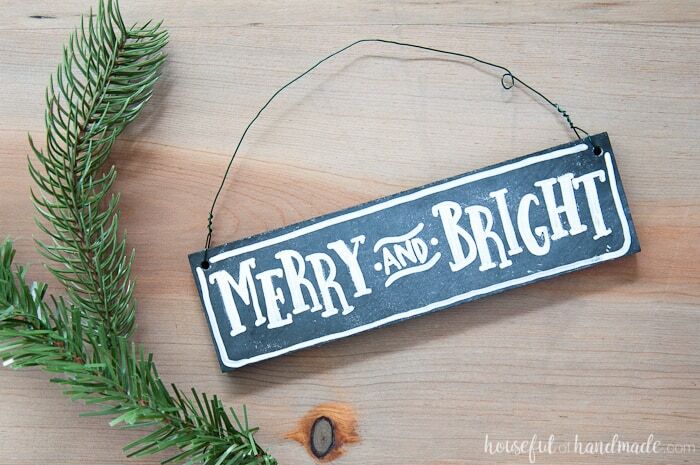 I am loving all the chalkboard things used in Christmas decor. I will have to make some of these for gifts! !